Monday, July 21, and beyond: Hazard-mitigation aid, community grants, business loans and more. Many requests were ruled ineligible because they did not meet federal regulations or project requirements, some aimed at preventing waste or abuse. However, some of those who unsuccessfully sought FEMA funds said they had legitimate uncovered expenses. In some cases they became so frustrated that they gave up trying to get the aid. The presidential disaster declaration for the violent storms that battered the state between May 18 and June 2, 2013, opened up conduits of cash help for both individuals and public groups. The individual assistance program is for housing and personal needs of affected people. “Public Assistance” funds go to local and state governments and nonprofits for emergency response, debris removal and rebuilding. FEMA has strict requirements for what qualifies as an eligible project or expense to receive public assistance funds, said Albert Ashwood, director of the Oklahoma Department of Emergency Management. Among the requirements is that the damage must have been a direct result of the disaster and be within the declared disaster area. The project also must cost more than $1,000 and not be a duplication of benefits, such as coverage of the same repairs by both FEMA and an insurance company. In addition, FEMA can deny funding for some damages sustained by public-sector groups that could have been insured but were not, Ashwood said. FEMA also conducts site reviews and audits of how the federal money was spent. According to data from Oklahoma Emergency Management, about 4 percent of projects submitted for public assistance funds were deemed ineligible for funds. Source: Federal Emergency Management Agency. * The City of El Reno’s repair work on streets in 19 locations was rejected for federal and state reimbursement because the city had not properly maintained the ditches to divert water from the street. * A temporary bridge in Nowata County, severely damaged by floodwater and debris, was found ineligible for funds because no hydrologic and hydraulic study had been done prior to its construction. * Damage to a dam submitted by the town of Dustin was ruled ineligible after inspectors determined that breaks in the concrete were old and existed before the disaster. * Nearly $200,000 in roof repairs at Oklahoma City Community College were rejected by FEMA after inspection found a lack of maintenance and no evidence that the damage was caused by the storm. * A reimbursement request of nearly $27,000 by the University of Oklahoma to cover volunteers’ work hours when OU opened up dormitories for victims of the Moore tornado. The university calculated the cost at more than $12 an hour per volunteer. FEMA rejections don’t necessarily mean organizations are trying to mislead the government, officials said. Most public workers who first report the damage are not experts in FEMA requirements, Barnes said. The damage that appears to be storm-related might have been caused earlier or was only partially due to the disaster-related storm. In Mid-Del Public Schools’ case, among the reimbursements being sought is about $150,000 to cover insurance deductibles paid for repair of damage, said Kay Medcalf, chief financial officer for the district. The school district submitted the third highest number of requests, 31, received awards or eligibility approval for 14, and is awaiting a decision on 10 others. OU and other groups were able to seek payments for volunteers’ costs because FEMA allows such awards, believing its costs will be less in the long run if it pays for donated resources, such as the volunteers enabling shelter space to be opened. FEMA offered no reason on its project worksheet for rejecting OU’s request. With the National Guard’s invoice for $22,074 to pay for the governor’s helicopter survey, FEMA issued a rejection saying viewing or surveying damage was not eligible for reimbursement under FEMA guidelines, according to the worksheet. While there is a case to be made that the expense was part of the state’s mission, Ashwood said, this example boils down to how unfamiliar many workers are with FEMA eligibility rules. Oklahoma Watch did obtain numbers of recipients and total amounts awarded by city and zip code. Statewide, for the entire 16-day disaster-declaration period, 27 percent of people who were referred to the program were granted funds, figures show. In Moore, the hardest-hit city, 20 percent of those referred to the individual assistance program were awarded funds, according to FEMA data. 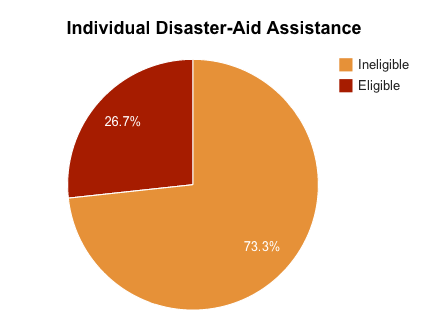 Nationwide for all disasters in 2013, the average eligibility rate for FEMA’s Individuals and Households program was 62 percent. Earl Armstrong, FEMA Region 6 spokesman said the program’s eligibility rates often vary by disaster, and there are several reasons an application may be found ineligible. One of the biggest factors is whether those affected have private insurance and what type of insurance, Armstrong said. For instance, Armstrong said, people are more likely to have homeowner’s insurance, which would cover damage from a tornado, than they are to have flood insurance. FEMA will not duplicate benefits but will cover remaining unmet needs after the insurer pays for covered damages, Armstrong said. In Oklahoma’s storm disaster last year, nearly 40 percent of referred applicants who were rejected reported they had insurance coverage but did not submit documentation showing they had additional uncovered needs, Armstrong said. When FEMA does pay, it covers a wide range of expenses, from possessions such as televisions and furniture to medical expenses and rent. 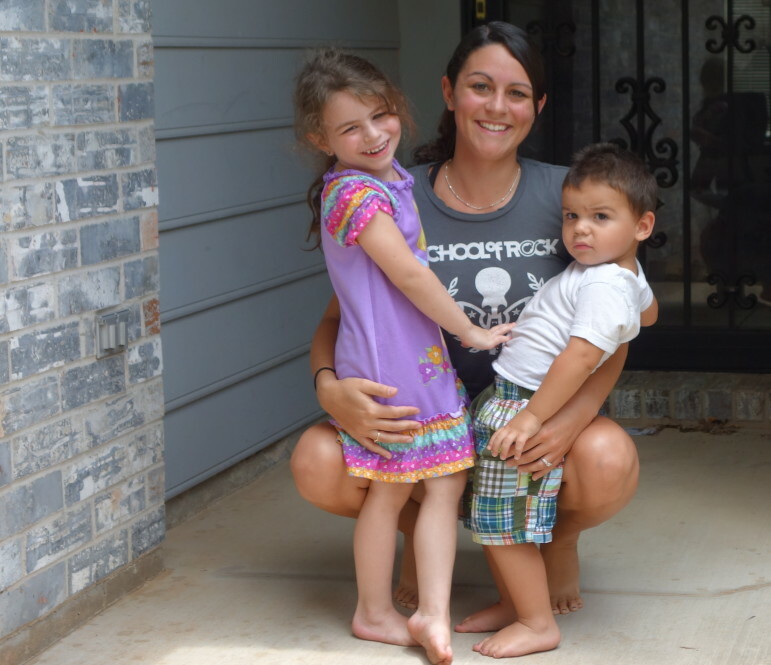 Susan Montesano and her two children, Aspen, 4 and Braden, 2 escaped from her and her fiancé’s rented house in Moore before it was leveled by the May 20 tornado. They received a $15,000 disaster-aid check within days. Susan Montesano narrowly escaped her and her fiancé’s rented house in Moore with her two young children before it was leveled by the May 20 tornado. The young mother was able to flee the oncoming storm with her children and make it to a storm shelter at her fiancé’s parent’s home, also in Moore. But after the storm blew over, a call from a friend who had gone to check on Montesano and her family confirmed the worst. “There’s nothing left,” the friend told her. The situation grew more depressing when Montesano realized that the family’s renter’s insurance had lapsed earlier that year. The process of getting individual assistance from FEMA went quickly, Montesano said. On May 22, she filled out the paperwork for the program. The next day, a FEMA inspector visited the site of the house and did an inventory of what was lost, she said. A day later, to Montesano’s surprise, almost $15,000 had been deposited by FEMA into her and her fiancé’s bank account. Not everyone affected by the storm had a pleasant experience with FEMA, however. Kristy Rushing and her husband James of Moore gave up on seeking reimbursement for out-of-pocket costs after initially being rejected by FEMA for individual assistance. The couple, who have foster children, said their homeowners insurance and donations didn’t cover all of their expenses. Moore residents Kristy and James Rushing live across the street from Plaza Towers Elementary, which was leveled by the May 20 tornado, as was the house Rushing shared with her husband and five foster children. The family made it through the tornado. But when it came time to rebuild, they ran into a problem: None of the homebuilders would rebuild their home for the amount covered by insurance. It took the insurance money covering the contents of their home to rebuild the house, Rushing said. The family also relied on donations of furniture and other household items for their home. But they still had to pay some costs out of pocket. 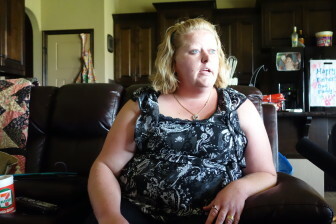 When the Rushings learned that FEMA had ruled they were ineligible for individual assistance, Kristy broke down. “I was hysterical pretty much,” Rushing said. “I know there are people who definitely needed it more than we needed it. But it’s hard to imagine somebody having five kids, with all these crazy circumstances, and losing absolutely everything getting zero help.” The Rushings gave up trying to seek additional aid. Ashwood said there are several ways emergency response agencies could improve the current system. One is to make at least a partial determination of what FEMA can assist with while inspectors are in the field, right after the disaster. KGOU Radio is airing stories on Disaster 4117, with Kate Carlton Greer reporting as part of The Oklahoma Tornado Project. The data team for Investigative Reporters and Editors and the Investigative News Network assisted with the project.